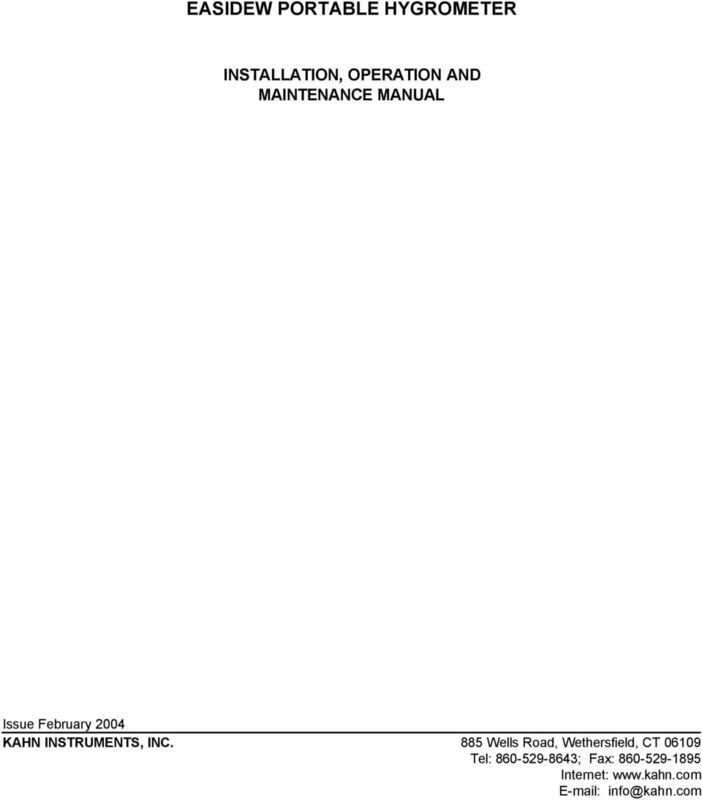 Download "EASIDEW PORTABLE HYGROMETER INSTALLATION, OPERATION AND MAINTENANCE MANUAL"
3 3 1. INTRODUCTION 1.1 General The Easidew Portable hygrometer is a transportable instrument for the measurement of moisture content in air and other gases over an operating range of -148 to +68 F dew point. 1.2 Ceramic Sensing Element The Easidew Portable hygrometer utilizes the Kahn ceramic moisture sensor manufactured from metalized ceramics using thin and thick film technologies. The Kahn ceramic moisture sensor is virtually chemically inert with inherently fast response, high calibration stability and high resistance to corrosive environments. The Easidew Portable hygrometer measures humidity by monitoring the electrical response exhibited by the sensor to variations in partial pressure of water vapor of the gas composition to which it is exposed. 1.3 Calibration Calibrations are performed using precision dewpoint generators and transfer standard optical hygrometers which have been calibrated directly at the National Institute of Standards & Technology (NIST) Gaithersburg, MD, USA. 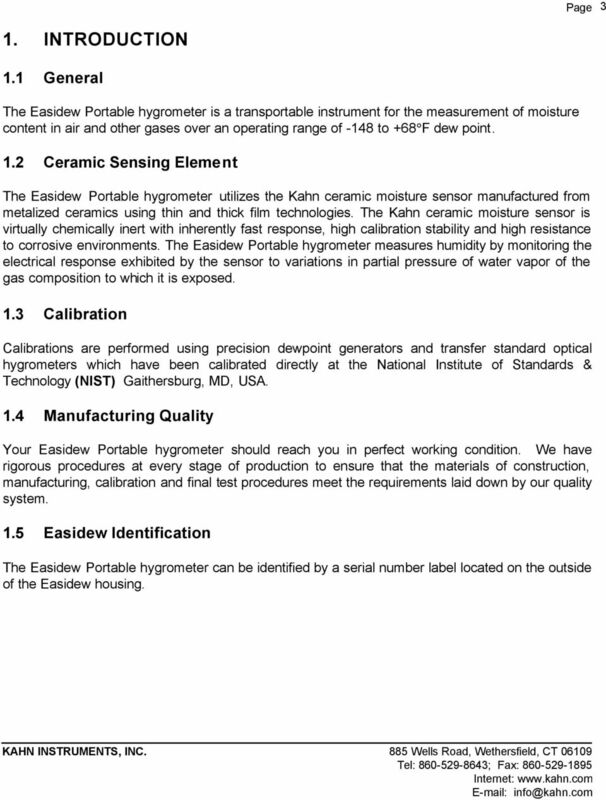 1.4 Manufacturing Quality Your Easidew Portable hygrometer should reach you in perfect working condition. We have rigorous procedures at every stage of production to ensure that the materials of construction, manufacturing, calibration and final test procedures meet the requirements laid down by our quality system. 1.5 Easidew Identification The Easidew Portable hygrometer can be identified by a serial number label located on the outside of the Easidew housing. 5 5 3. USER CONTROLS 2 POWER ON/OFF SWITCH 3 CURRENT OUTPUT SOCKET 4 FUSE 5 BATTERY COMPARTMENT SCREWS 1 DISPLAY Easidew Portable Hygrometer Cdp Power o Fuse 6 BATTERY PACK I 4-20 ma O/P To measure at Gas Out Gas In Battery Battery Level Charger 7 BATTERY CHARGING SOCKET line pressure 2 1 atmospheric 1 pressure 2 10 BATTERY LEVEL METER 9 GAS OUT CONNECTION 8 GAS IN CONNECTION (FILTER LOCATED BELOW) 1 Digital Display - Indicates the current dew point in F from to 148. 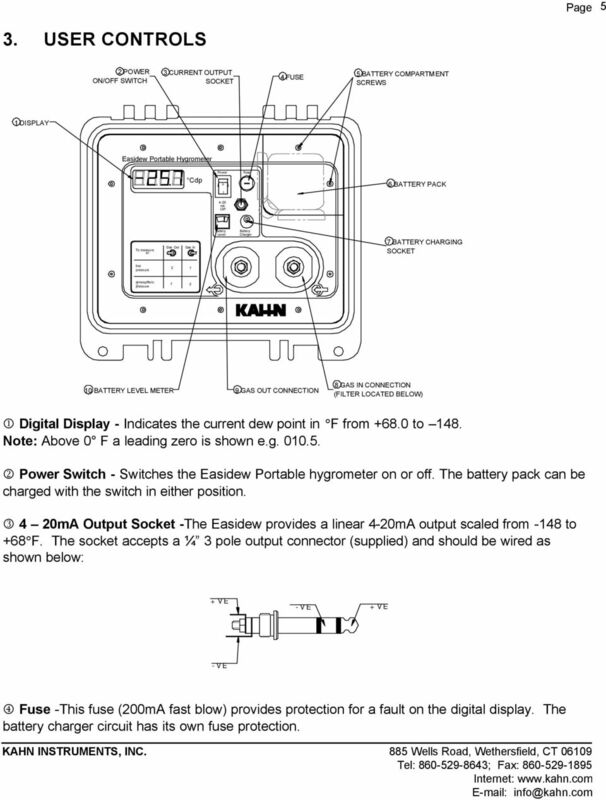 Note: Above 0 F a leading zero is shown e.g Power Switch - Switches the Easidew Portable hygrometer on or off. The battery pack can be charged with the switch in either position. 4 20mA Output Socket -The Easidew provides a linear 4-20mA output scaled from -148 to +68 F. The socket accepts a ¼ 3 pole output connector (supplied) and should be wired as shown below: +VE -VE +VE -VE 4 Fuse -This fuse (200mA fast blow) provides protection for a fault on the digital display. The battery charger circuit has its own fuse protection. 6 6 6 Battery Pack - Located in the top right hand corner of the instrument. It can be accessed by removing two screws. The battery pack uses 4 x C Nickel Metal Hydride cells, which can be recharged using the supplied charger, via the battery-charging socket 7. The battery pack should be recharged whenever the battery level meter is in the red region. The instrument can continue to be used while the battery pack is being charged. 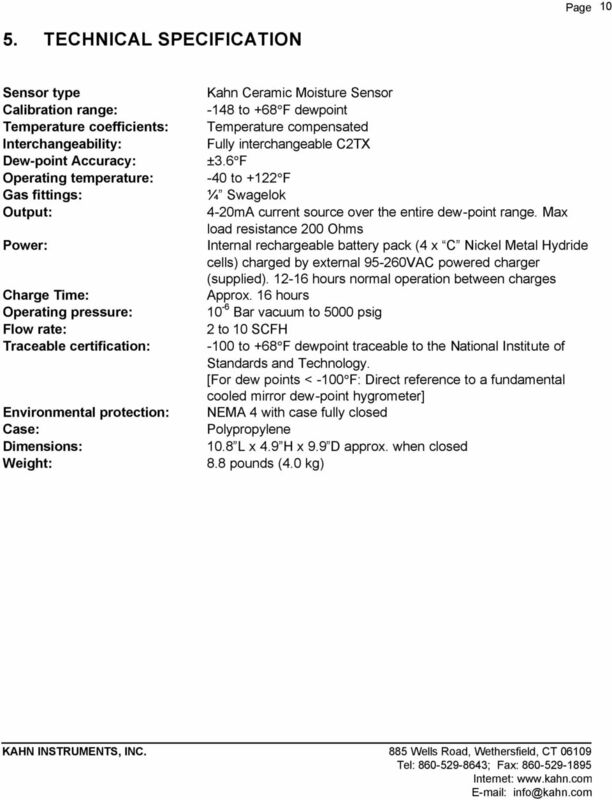 If necessary, it is possible to use standard C cells to power the instrument. Caution: Do not attempt to recharge non-rechargeable cells. 8,9 Gas Connections -The Easidew Portable hygrometer can be used for measurements at either atmospheric or line pressure (up to 150 PSIG) by utilizing connections with different size orifice on the gas inlet to provide both flow and pressure control. The gas connections are a ¼ Swagelok suitable for ¼ OD PTFE pipe. There is a particulate filter (99.5% removal of 0.1 micron particles) installed as standard under the gas inlet connection. 8 8 Many factors will affect the speed at which the Easidew Portable hygrometer will give a satisfactory result. However, speed of response will increase if the Easidew Portable hygrometer is being used to detect an increase in the moisture content of your sample gas. However, since response characteristics from dry to wet are orders of magnitude faster than from wet to dry, the effective response speed of the system to leaks, ingress of moisture, etc. is very fast. In an application such as dryer monitoring or glove box monitoring, the Easidew Portable hygrometer will respond in a few seconds to an increase in moisture content. In practice, the time taken to dry down the Easidew Portable hygrometer from ambient conditions to the operational dewpoint level of the process will normally be shorter than the time taken to dry down the process itself. Therefore when the Easidew Portable hygrometer is installed into the system prior to system start-up, there is normally no time lag before representative test results are obtained. When a new Easidew Portable hygrometer is installed into an operational system, then typically fifteen to thirty minutes should be allowed for the tubing, filter and the Easidew Portable hygrometer to reach equilibrium with the sample gas passing through. 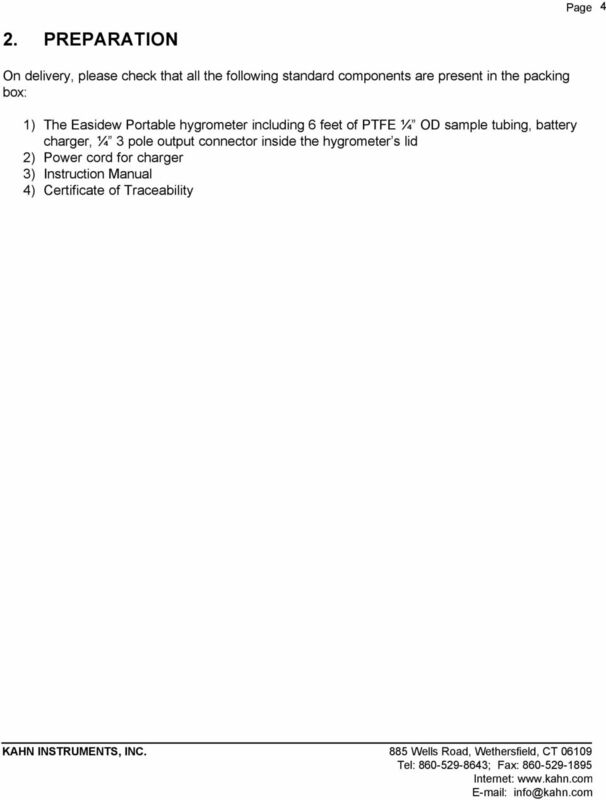 3.3 Which Gases to Measure The Easidew Portable hygrometer, by nature of its design, is suitable for measurement of the moisture content of a wide variety of gases. In general, if the gas (in conjunction with water vapor) is not corrosive to ceramics or base metals then it will be suitable for measurement by the Easidew Portable hygrometer. 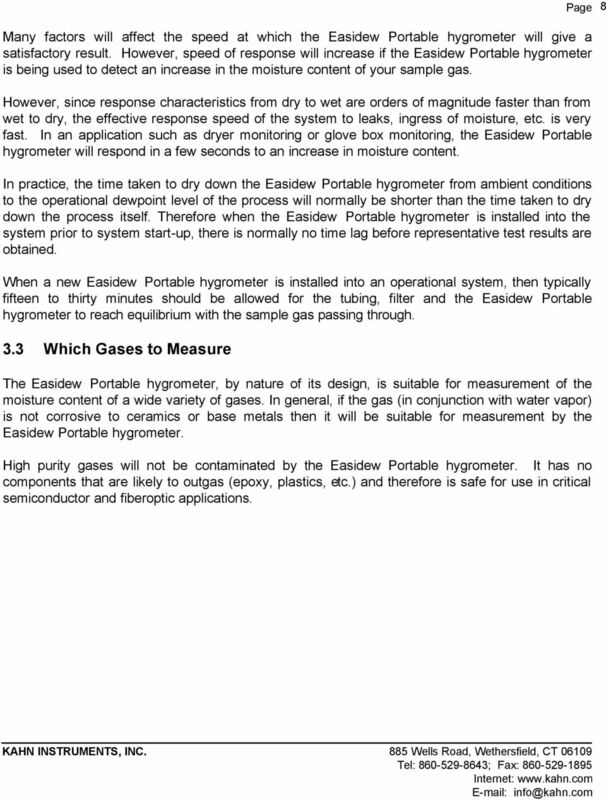 High purity gases will not be contaminated by the Easidew Portable hygrometer. It has no components that are likely to outgas (epoxy, plastics, etc.) and therefore is safe for use in critical semiconductor and fiberoptic applications. 9 9 4. 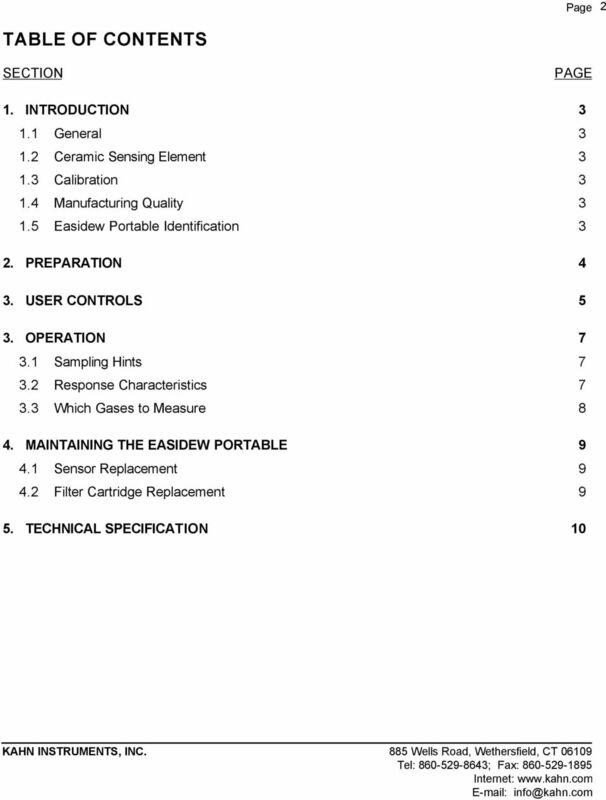 MAINTAINING THE EASIDEW PORTABLE HYGROMETER Routine maintenance of the Easidew Portable hygrometer is confined to regular re-calibration of the ceramic sensor and replacement of the filter cartridge. This work can only be done by exposure of the sensor to sample gases of known moisture content. Calibration services traceable to the National Institute of Standards and Technology (USA) are provided by Kahn Instruments. In most applications annual re-calibration ensures that the stated accuracy of the Easidew Portable hygrometer is maintained. 4.1 Sensor Replacement 1. 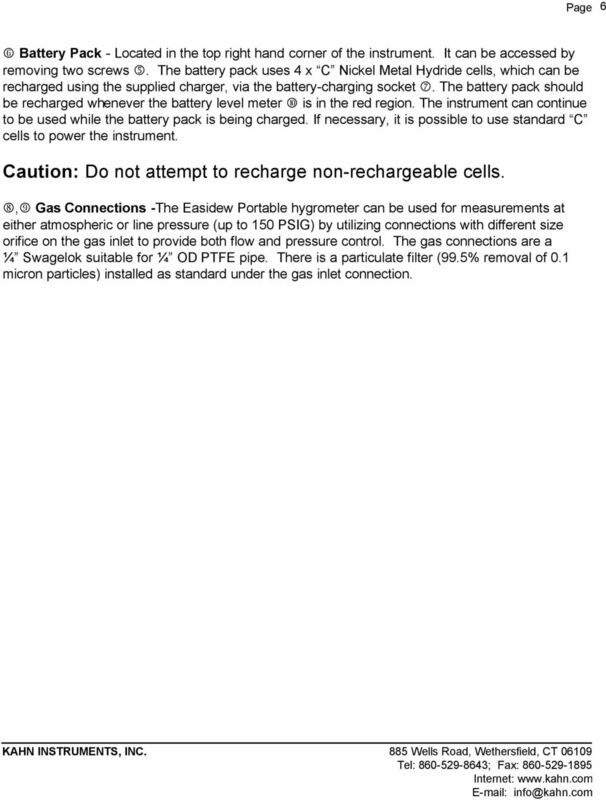 Remove battery pack (see Section 3, USER CONTROLS, Battery Pack) 2. Remove the remaining 8 screws from the top plate. 3. Lift the top plate of the instrument out of the case along with all the electronics and sensor. 4. Undo the screw from the center of the sensor connecting plug and pull of the connector. 5. Unscrew the sensor from the block. 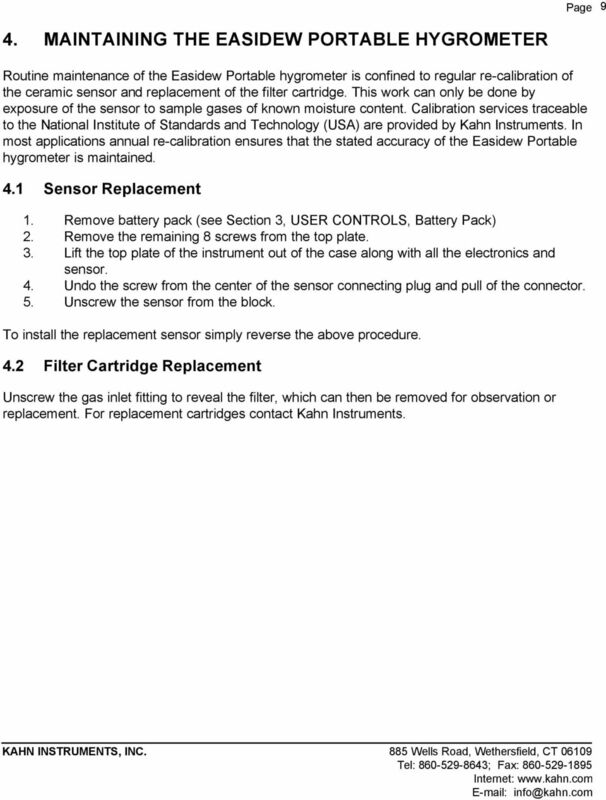 To install the replacement sensor simply reverse the above procedure. 4.2 Filter Cartridge Replacement Unscrew the gas inlet fitting to reveal the filter, which can then be removed for observation or replacement. For replacement cartridges contact Kahn Instruments. Moisture and Hydrocarbon Dew Point Solutions Process Analysers Background to Michell Instruments Michell Instruments is the international leader in the field of moisture and humidity measurement solutions. How is Dew Point Measured Reliably? WHITE PAPER: Relative Humidity Sensor Behavior and Care By Steve Cavlier. 1. What is Relative Humidity? Model SDT Dewpoint Transmitter Instruction Manual Model SDT Dewpoint Transmitter Instruction Manual Unpacking your Shaw Moisture Meters Model SDT Please examine the SDT package for any damage or mishandling. 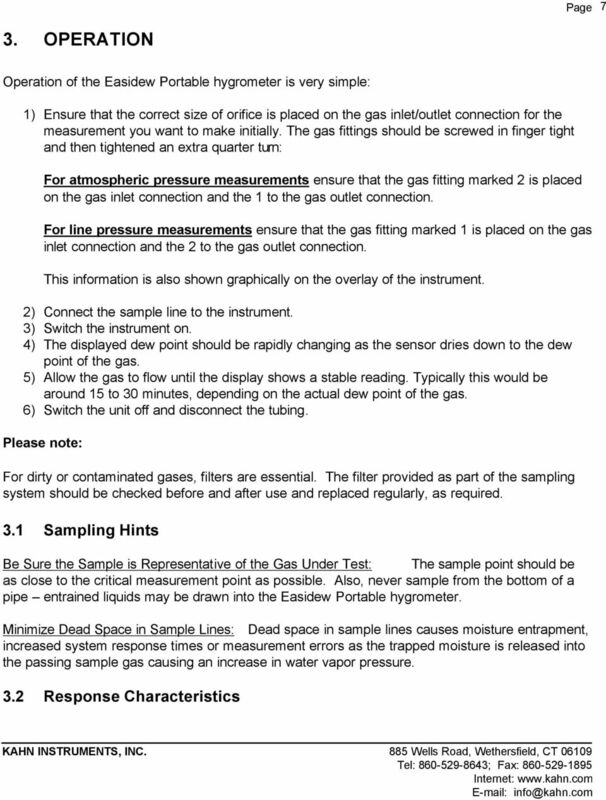 Validation of Process Gas Systems By Jeff Hargroves Alza Corporation Validation of process gas systems involve documenting the expected system behavior, and verifying that the system performs as expected.